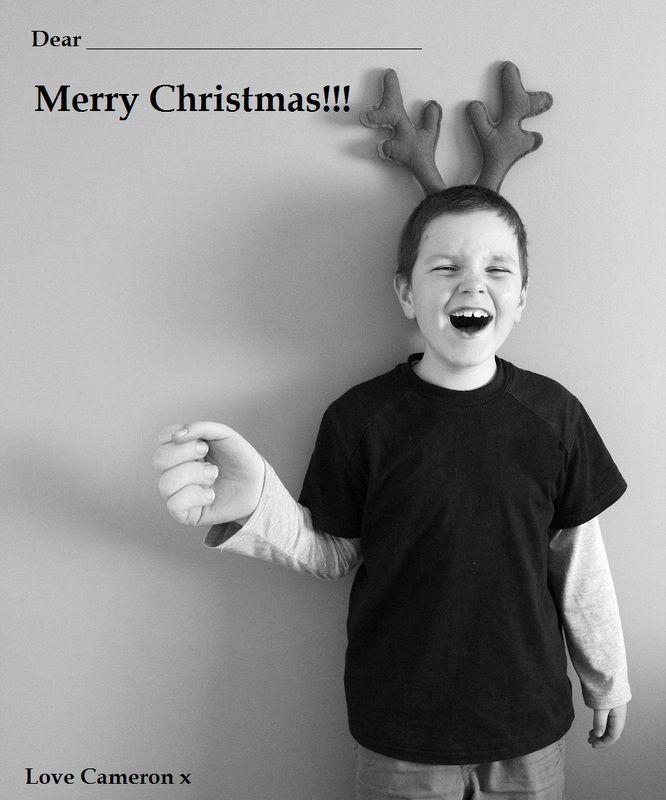 The unrelenting avalanche of Christmas cards and candy canes from Cameron's classmates has begun. I swear we still have candy canes left over from last year. Somewhere. The novelty of receiving candy canes lasts through about the consumption of four of them, and the rest, well, who knows. In a sad, little forgotten pile in somebody's room, no doubt. Still, they are lovely to receive, and as a rule, we usually give them out as well. Although, as is the traditional custom around this time of year, we make our own cards, because I'm a real fuss-pot and can't really find anything I like. They are either too boring, too dear, too cutesy-poo, too cheap-looking or we've already received half a dozen in the same design. I know the recipients are only six years old, and probably don't really care, but my finicky nature gets in the way of doing what's easy. Gosh, anyone would think there are a hundred hours a day in Lainie-land, which could not be further from the truth. Besides which, my boy is not going to let me take these cute, silly photos of him forever. So I'll run with it while I can. Last year's effort was sort of a last minute rush, but turned out dirt cheap and effective enough for Cam's five-year-old friends. I made candy cane baggies for them in lieu of Christmas cards (I hate stuffing and sealing envelopes, blerk!). Seventy two mini candy canes cost me under four bucks, plus with the left over stationery from Cameron's party invites, I was able to make close to 6 dozen of these for next to nothing. What a Scrooge. This year, we did a postcard-type affair, using the same idea as was used here. My original thought was that I would have Cameron holding a candy cane, but they are too bulky and they buckle up the finished card way too much. 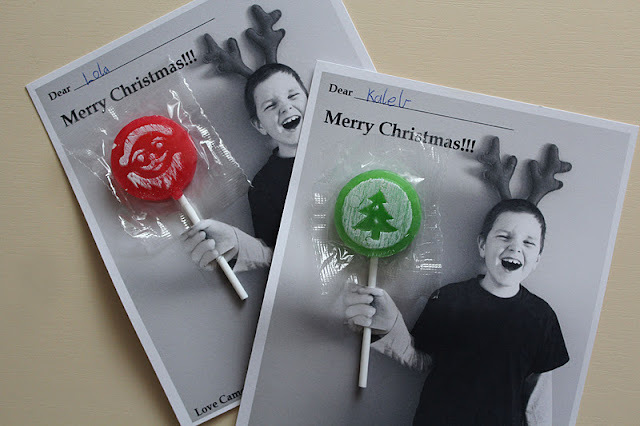 We were lucky enough to find Christmas lollipops at Red Dot, which worked brilliantly. ...besides the addition of text, did you spot the difference? Before inserting the lollipops, I firstly passed a bamboo skewer through the slits (the point on the end makes it easy). This just helped to 'prime' the slits and made inserting the slightly wider, blunt-ended lollipop stick through a bit easier. Last but not least, to protect them, we sheared the snap-lock bit off of some snap-lock sandwich bags, which were the perfect size, popped the cards in and taped them at the back. Too easy. And good for giving to the grandparents, too (it has Nanna Pat's seal of approval)! Cute! How did you pop his hand out like that??? Great post so nice to meet you, I have just found your lovely blog through the blog hop this weekend wonderful to join in. I'm now following you hope you visit me and follow back so nice to find new friends to catch up with. Have a great day. I love this idea! The shape is great, the colors are wonderful, and you've found a perfect use for Christmas cards.